The noises coming from Jupiter sound like they’re straight out of a Halloween movie. When NASA’s Juno spacecraft made its first full orbit around Jupiter on August 27, an instrument on board called Waves recorded the gas giant’s auroras. The emissions of the light show—which is similar to the northern and southern lights on Earth but on a vastly larger scale—were discovered in the 1950s but never able to be analyzed up close until now. NASA engineers have recently shifted 13 hours of radio emissions from Jupiter’s intense auroras into the audio frequency range so they can be heard by the human ear. They fall between seven and 140 kilohertz. In this video posted by NASA, they auroras are displayed both audibly and visually in a format similar to a voiceprint, meaning the intensity of the sound waves is depicted as a function of frequency in time. The warmer the color, the more intense the waves. So what can we make of these sounds? It turns out they pointed us to the strongest emission of energetic particles in the solar system, and we can use this to learn more about their origin. The Waves instrument will next take a measurement on November 2. Science not affected yet, but if problem isn’t fixed Juno will fly fewer orbits. For NASA's Juno spacecraft, all had been going well since its July 4th insertion into orbit around Jupiter—as well as things can go when radiation is slowly eating away at a spacecraft, that is. That ended when mission managers tried to send a command to the robotic probe on Thursday. According to a NASA news release, two helium check valves that play an important role in the firing of the spacecraft's main engine did not operate properly during the command sequence. "The valves should have opened in a few seconds, but it took several minutes," Rick Nybakken, Juno project manager at NASA's Jet Propulsion Laboratory, said. "We need to better understand this issue before moving forward with a burn of the main engine." NASA had intended to fire the spacecraft's Leros 1b engine, its primary source of thrust, next Wednesday. The goal was to bring Juno into a shorter orbital period around the gas giant, from 53.4 to 14 days. The optimal time for such a "period reduction maneuver" is when the spacecraft is closest to the planet, so Juno's next opportunity for this engine burn will not come until Dec. 11. This was to be the final burn of the Leros 1b engine, which fired perfectly on July 4 to put Juno into a precise orbit around Jupiter. Future maneuvers can be conducted by smaller onboard thrusters. Mission scientists emphasized that the longer orbital period would not affect the quality of science that Juno can collect as it flies close to the planet's poles. However, if the issue cannot be resolved, the spacecraft will not be able to make as many flybys as scientists hoped due to expected degradation of the spacecraft and its scientific instruments as it flies through Jupiter's harsh radiation environment. NASA hoped Juno would make 36 orbits during the next 20 months. A new image, processed by a citizen scientist using data from a NASA spacecraft near Jupiter, shows the huge planet in a friendly new light. While Jupiter — the largest planet in our solar system — is usually known for its immense gravity and extreme belts of hazardous radiation, the world looks distinctly happy, with a large smile in this new image created from data collected by NASA's Juno mission. Randy Ahn created the smiley photo by copying and flipping an image of a "half-lit" Jupiter, mirroring it on itself, according to NASA. 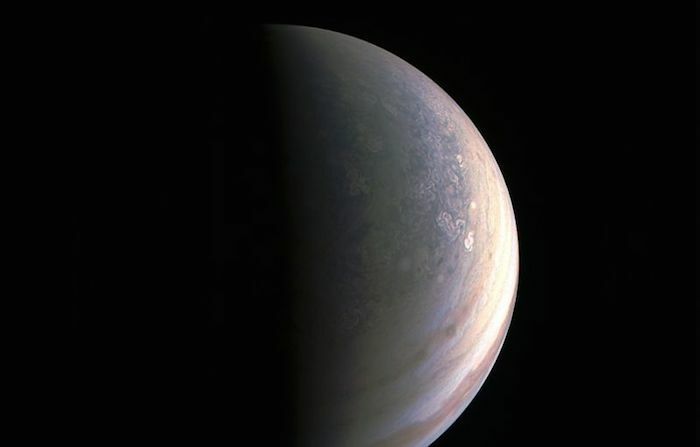 The new image was released as part of the agency's JunoCam initiative, which asks people to process raw images beamed back from Jupiter by Juno. "The amateurs are giving us a different perspective on how to process images," Candy Hansen, JunoCam imaging scientist, said in a statement. "They are experimenting with different color enhancements, different highlights or annotations than we would normally expect. They are identifying storms tracked from Earth to connect our images to the historical record. This is citizen science at its best." Juno is also beaming back plenty of science in its own right, but the spacecraft — which reached Jupiter in July — recently ran into some snags. Another citizen scientist-processed image of Jupiter. The spacecraft went into "safe mode" unexpectedly on Tuesday, when a monitor forced a reboot of Juno's computer after detecting something wasn't right. Because of that safe mode, the science instruments were turned off, and the spacecraft wasn't able to gather scientific data during a close flyby of Jupiter. Mission controllers still aren't sure exactly why the spacecraft went into safe mode, but radiation doesn't seem to be the culprit. “At the time safe mode was entered, the spacecraft was more than 13 hours from its closest approach to Jupiter,” Rick Nybakken, Juno project manager, said in the statement. NASA is also looking into another problem with Juno involving valves important to its propulsion system. Last week, mission controllers put off an engine burn that would have brought Juno's orbit down to 14 days, instead of 53, but due to the issue, they decided to postpone. It's not yet clear when or if engineers will decide to change Juno's orbit, but even if it does stay in the longer orbit for the rest of its mission, it will still be scientifically productive, according to Juno principal investigator Scott Bolton. "The worst-case-scenario is I have to be patient and get the science slowly," Bolton said. If they have to stick to the 53-day orbit, "the science opportunities are all there," he added. In spite of those setbacks, scientists are still working through analyzing data sent home from Juno gathered during its close flyby of Jupiter on Aug. 27. Scientists are starting to peer beneath Jupiter's cloud tops for the first time, checking out the layers below. "We are seeing that those beautiful belts and bands of orange and white we see at Jupiter’s cloud tops extend in some version as far down as our instruments can see, but seem to change with each layer," Bolton said. Juno also gathered data about the planet's strong magnetic field and its extreme auroras, but those discoveries are expected to be announced later this year. NASA’s Juno spacecraft went into safe mode last night, 13 hours before it swung close by the surface of Jupiter. Since July 4th, Juno has been in a highly elliptical orbit around the gas giant, swinging close by Jupiter every 53 days to take scientific measurements of the planet and its insides. But since Juno was in safe mode, all of the vehicle’s instruments were automatically turned off and were unable to collect any data during this most recent pass by the planet. IT "DETECTED A CONDITION THAT WAS NOT EXPECTED"
It’s unclear what caused Juno to go into safe mode, but NASA thinks it may be related to a software problem that caused the onboard computer to reboot. At a press conference today, Juno principal investigator Scott Bolton said the vehicle had "detected a condition that was not expected," but he did not think the problem was related to the radiation environment around Jupiter. Whatever happened caused Juno to turn off all its "unnecessary subsystems" — including its science instruments — and point itself toward the Sun to get as much power as possible. It’s now awaiting further instructions from NASA on the ground. Bolton says the spacecraft is healthy, though, and the mission team is working to getting it back to optimal working conditions. This marks the second road bump for Juno in the last week. On Friday, NASA announced that it was going to delay changing Juno’s orbit —a move that was supposed to happen today. When Juno passed by Jupiter today, NASA was going to ignite the spacecraft’s main engine, putting the vehicle into a shorter 14-day orbit around Jupiter. But the space agency decided to postpone that because a couple of valves in Juno’s engine didn’t behave as expected. Delaying the shift doesn't detract from the science that Juno can do at Jupiter; it just means the mission could take longer to pull off. Right now it takes 53 days for the spacecraft to complete one orbit and pass close by the planet — what is known as a perijove pass. That's the prime time for Juno to do its science at Jupiter. Staying in a 53-day orbit simply means those passes will happen less frequently. "The worst case scenario is I have to be patient and get the science slowly," Bolton said at the conference. Still, the Juno team has two big problems to solve now: figuring out why the spacecraft went into safe mode and why the engine isn’t working like it should. But the mission has still led to some interesting discoveries about Jupiter in the meantime. Juno conducted its first perijove pass on August 27th with all of its science instruments on, and based on that data, NASA now knows that Jupiter's magnetic field and aurora are a lot bigger than originally thought. The pass also gave Juno its first peek underneath the surface of Jupiter, finding that the planet's clouds extend as far below as the spacecraft's instruments can see. And they are constantly changing the farther down they go. "It is as if we took an onion and began to peel the layers off to see the structure and processes going on below," Bolton said in a press release. NASA's Juno spacecraft at Jupiter has left safe mode and has successfully completed a minor burn of its thruster engines in preparation for its next close flyby of Jupiter. Mission controllers commanded Juno to exit safe mode Monday, Oct. 24, with confirmation of safe mode exit received on the ground at 10:05 a.m. PDT (1:05 p.m. EDT). The spacecraft entered safe mode on Oct. 18 when a software performance monitor induced a reboot of the spacecraft's onboard computer. The team is still investigating the cause of the reboot and assessing two main engine check valves. "Juno exited safe mode as expected, is healthy and is responding to all our commands," said Rick Nybakken, Juno project manager from NASA's Jet Propulsion Laboratory in Pasadena, California. "We anticipate we will be turning on the instruments in early November to get ready for our December flyby." In preparation for that close flyby of Jupiter, Juno executed an orbital trim maneuver Tuesday at 11:51 a.m. PDT (2:51 p.m. EDT) using its smaller thrusters. The burn, which lasted just over 31 minutes, changed Juno's orbital velocity by about 5.8 mph (2.6 meters per second) and consumed about 8 pounds (3.6 kilograms) of propellant. Juno will perform its next science flyby of Jupiter on Dec. 11, with time of closest approach to the gas giant occurring at 9:03 a.m. PDT (12:03 p.m. EDT). The complete suite of Juno's science instruments, as well as the JunoCam imager, will be collecting data during the upcoming flyby. "We are all excited and eagerly anticipating this next pass close to Jupiter," said Scott Bolton, principal investigator of Juno from the Southwest Research Institute in San Antonio. "The science collected so far has been truly amazing." The Juno spacecraft launched on Aug. 5, 2011, from Cape Canaveral, Florida, and arrived at Jupiter on July 4, 2016. During its mission of exploration, Juno soars low over the planet's cloud tops -- as close as about 2,600 miles (4,100 kilometers). During these flybys, Juno probes beneath the obscuring cloud cover of Jupiter and studies its auroras to learn more about the planet's origins, structure, atmosphere and magnetosphere. NASA is preparing for Juno to stick around Jupiter a lot longer than it had originally planned. The probe — which has been orbiting the gas giant since July — is going to stay in its 53-day orbit around the planet for a while, with no definitive plans at the moment to put the vehicle in a shorter orbit. Originally, NASA had hoped to have Juno in a two-week orbit by now, but ongoing engine troubles are delaying that move. If Juno never goes into its shorter orbit, it’s not exactly bad news. NASA says it won’t diminish the amount of science Juno can do at Jupiter. The biggest difference is that the spacecraft will be swinging by the planet at a much slower rate, so the mission could conceivably last beyond 2019, instead of its previously scheduled end of February 2018. The trouble for Juno started last month, right before the spacecraft was about to do its second swing by Jupiter. The vehicle doesn’t orbit the planet in a circle but takes a highly elliptical path in order to avoid as much of the radiation-filled environment around Jupiter as possible. Because of this, Juno gets super close to the surface of Jupiter for just a few hours each orbit. These close passes are known as Perijove passes, and they’re the times when Juno can gather the most data. The most recent Perijove pass occurred on October 19th, but the mission team didn’t intend to do any science on that one. Instead, the plan was to ignite Juno’s main engine, putting the vehicle in the shorter 14-day orbit. The engine burn can only be done during a Perijove pass and none of the science instruments can be on when it happens. Leading up to the pass, NASA engineers found that a few engine valves were taking longer to open than they were supposed to. "That is something that is significant because it can affect how the engine operates," Rick Nybakken, Juno project manager at NASA’s Jet Propulsion Laboratory, tells The Verge. NASA decided to scrap the engine burn for the October 19th pass and take science measurements of Jupiter instead. But then a software glitch put Juno into safe mode. This mode turns off all of the vehicle’s instruments and prompts the probe to turn toward the Sun while it awaits instructions from Earth. NASA was able to resolve the glitch and bring Juno out of safe mode on October 24th, but at that point the Perijove pass was completed and no science data was gathered. Now, NASA is focusing on the engine troubles. The mission team won’t be performing a burn on Juno’s upcoming Perijove pass, scheduled for December 11th, and they’re preparing for the possibility of never igniting the spacecraft’s engine again. "That’s the thing we’re looking at," says Nybakken. "We’re not going to do it if we can’t do it safely. And so we’re looking at different ways we can do the burn. Right now, it’s too early to say which way it’s going to go." That means Juno may not de-orbit in February 2018 like NASA had expected. Instead, the mission could last beyond 2019, according to Nybakken. That’s because the spacecraft will be exposed to the worst parts of Jupiter’s radiation less frequently. Eventually, all those charged particles around the planet will slowly damage Juno enough that it can’t function anymore. But Juno only receives the bulk of the planet’s radiation when it does its flybys of Jupiter. So on a 53-day orbit, the vehicle gets pelted with the worst radioactive doses at a much slower rate. "Radiation accumulation is a function of the number of orbits and not a function of time," says Nybakken. "So it’s really hard to gauge impacts of radiation perspective other than to keep in mind, we accumulate on a full orbit basis not on a time basis." The only real problem? An eclipse in mid-2019 that would put Juno in Jupiter’s shadow for six to 10 hours. During that time, the spacecraft would not get any sunlight on its solar panels and its temperature would drop significantly. Juno has gone through periods of no sunlight before, but never for such an extended period of time. So NASA’s navigators are trying to figure out a way to change Juno’s orbit to avoid the eclipse, in case the probe is still operating by then. "That looks like a significant obstacle that we’d have to overcome," says Nybakken, "but we have very creative navigators." 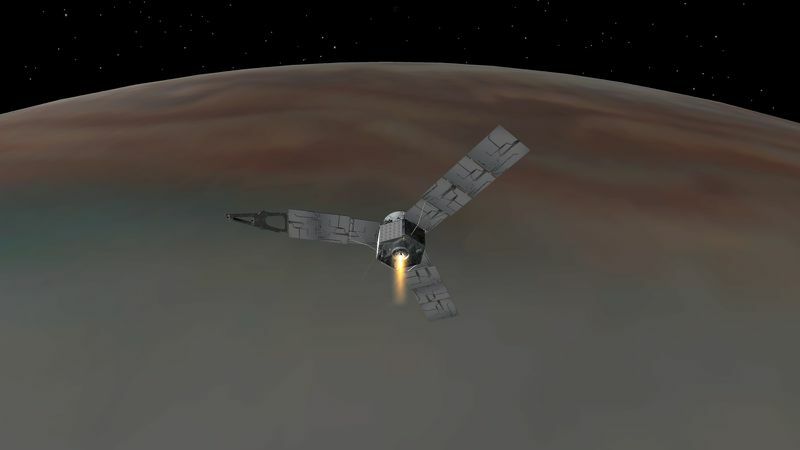 Artist's concept of the Juno spacecraft orbiting Jupiter. At the time of closest approach (called perijove), Juno will be about 2,580 miles (4,150 kilometers) above the gas giant’s roiling cloud tops and traveling at a speed of about 129,000 mph (57.8 kilometers per second) relative to the planet. 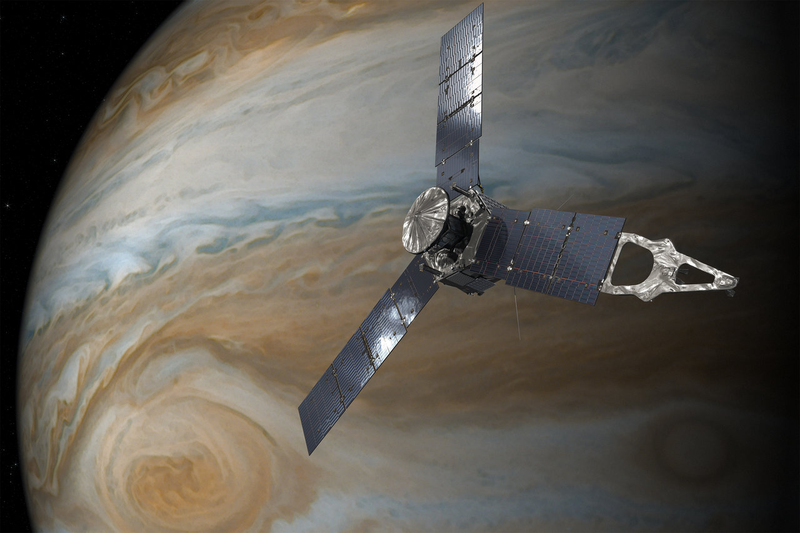 Seven of Juno’s eight science instruments will be energized and collecting data during the flyby. 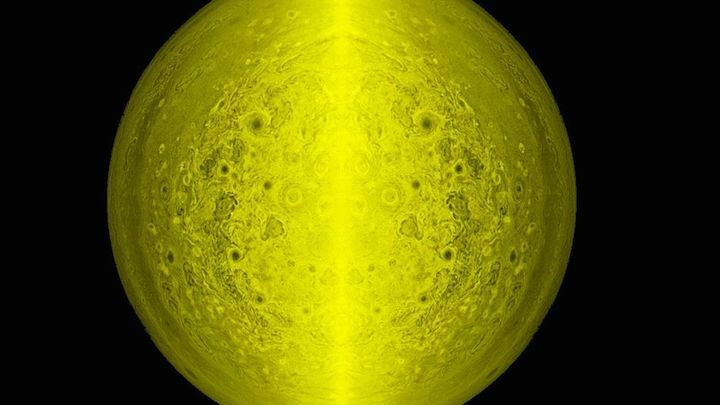 Mission managers have decided not to collect data with the Jovian Infrared Auroral Mapper (JIRAM) instrument during the December flyby, to allow the team to complete an update to the spacecraft software that processes JIRAM’s science data. A software patch allowing JIRAM’s operation is expected to be available prior to the next perijove pass (PJ4) on Feb. 2, 2017. The spacecraft team continues to weigh its options regarding modifications of Juno’s orbital period -- how long it takes for the spacecraft to complete one orbit around Jupiter. At present, Juno’s orbital period is 53.4 days. There had been plans to perform a period adjustment maneuver with the spacecraft’s main engine on Oct. 19 to reduce the orbital period to 14 days. The team made the decision to forgo the maneuver in order to further study the performance of a set of valves that are part of the spacecraft's fuel pressurization system. The period reduction maneuver was the final scheduled burn of Juno's main engine. In collaboration with NASA and the Juno team, Apple will release an interactive guide to the mission (an iBook) on Dec. 11. Juno's name comes from Roman mythology. The mythical god Jupiter drew a veil of clouds around himself to hide his mischief, and his wife -- the goddess Juno -- was able to peer through the clouds and reveal Jupiter's true nature. NASA’s Juno spacecraft, has been locked in orbit around Jupiter for five months now. On Sunday at 12:04 p.m. Eastern, the solar-powered probe is set to make its third science orbit, and closest flyby yet of the gas giant. Each pass is known as a PeriJove, and at the time of closest approach, Juno will skirt 2,580 miles — or roughly the distance from Boston to Los Angeles — above the gas giant’s thick clouds. Racing overhead at speeds of about 129,000 mph (relative to the planet), seven of Juno’s eight science instruments will be energized and busy collecting as much data as possible. Juno builds on the success of NASA’s Galileo mission, and promises to uncover some of Jupiter’s biggest mysteries. Following a five year trek through the inner solar system, people around the world cheered as the robotic space explorer successfully inserted itself into orbit around the solar system’s largest resident. Image of Jupiter's swirling atmosphere created by a citizen scientist and Juno's JunoCam instrument. We’re now 150 days into the mission, and Juno is about to embark on its third science-collecting orbit, which puts it a bit behind schedule. By this point in the mission, Juno should have completed six or seven close fly-bys of Jupiter while in the smaller orbit. However, an issue with the spacecraft prevented it from entering into its planned science orbit. The planned maneuver was scheduled to take place during the October 19 flyby, and involved shrinking the spacecraft’s orbit from the current 53.4 day orbit to just 14 days. However, before the period reduction maneuver (or PRM) could be conducted, the team noticed an issue with the craft’s helium pressure valves, and delayed the switch. The spacecraft team expected to make the transition to a 14-day orbit with the December 11 pass. However, that’s not the case. The team has decided to forgo the maneuver in order to further analyze the valves’ performance. It may sound like a major setback, but the spacecraft is healthy and is still able to collect incredible science data in its current orbit. An infrared view of Jupiter's southern aurora as seen by the Juno spacecraft. During Sunday’s flyby, the suite of on board instruments will collect a wealth of data including an in-depth analysis of the planet’s innards via its gravity field. Juno discovered that Jupiter's stormy cloud layers extended deep into the atmosphere. Mission managers have decided not to keep the Jovian Infrared Auroral Mapper (JIRAM) instrument off during the December flyby, as the team needs to update the instrument’s software. JIRAM will be up and running in time for the the next perijove pass, dubbed PJ4, which is slated for February 2, 2017. NASA's Juno mission has successfully completed its third close approach of Jupiter, NASA confirmed on Monday. Still in a 53-day orbit, the spacecraft is not due to make another close pass until Feb. 2, 2017. The moment of closest approach to Jupiter's cloud tops occurred at precisely 9:04 a.m. PST (12:04 p.m. ET) on Sunday (Dec. 11) when the spacecraft was traveling at the breakneck speed of 129,000 miles per hour. The point of closest approach in Juno's orbit — known as "perijove" — brought the solar-powered spacecraft around 2,580 miles (4,150 kilometers) from the gas giant's atmosphere, allowing the mission to gather incredibly precise measurements of the planet's magnetic field, gravity and chemical composition. Seven of its eight instruments were operational during perijove and NASA expects the close encounter data to be beamed back to Earth over the next few days for analysis. According to the Juno's principal investigator Scott Bolton, of the Southwest Research Institute in San Antonio, this was the first time the mission was used to fully investigate Jupiter's internal structure by measuring the planet's gravitational field. "We are looking forward to what Jupiter's gravity may reveal about the gas giant's past and its future," he said before Sunday's encounter. 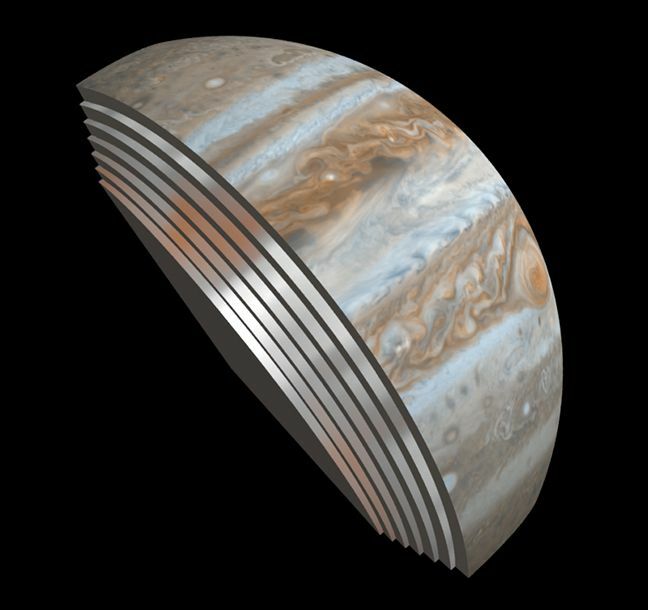 The only instrument not powered-up during perijove was the Jovian Infrared Auroral Mapper (JIRAM), which was offline while the Juno team completed a software update that processes science data. JIRAM is expected to be fully operational for its fourth perijove in February. According to a NASA statement, mission scientists are still weighing up options as to how the spacecraft's 53-day orbit will affect operations. In October there were plans for Juno to carry out an engine burn that would have slowed the spacecraft, placing it into a shorter 14-day orbit. But during routine checks before the maneuver, a glitch was uncovered in two of the engine fuel valves. The decision was taken not to risk firing the spacecraft's main engines and instead commit to a longer 53-day loop around the Jovian system. Juno is expected to remain in orbit for 20 months, adding a wealth of information to our knowledge not only about how Jupiter came to be, but also add more detail to how other planets form in our solar system and around other stars. Though its sensitive electronics are protected in a special enclosure, Juno isn't expected to live much beyond its planned mission lifespan. The volume surrounding the gas giant is one of the most radioactive regions of the solar system, filled with ionizing particles that will eventually erode the spacecraft's systems. Before irreparable damage occurs, to protect Jupiter's moons from biological contamination from a crashing spacecraft, Juno will be commanded to plunge into the Jovian atmosphere at the end of its mission, taking data as it burns up, ultimately becoming one with the planet's atmospheric gases.